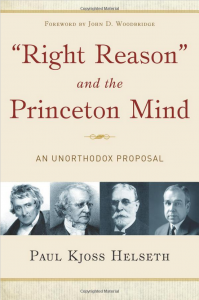 This book is subtitled: “An Unorthodox Proposal.” Helseth sets out to defend the theologians of Old Princeton (Alexander, Hodge, Warfield, Machen) against the accepted scholarly opinion of their theology. The accepted opinion states that these men illegitimately borrowed categories and philosophies from Enlightenment thinking, such as Scottish Common Sense Realism and Baconianism. And so, this view states, the Old Princeton theologians were merely modernist thinkers. The specific charge is that they allow parts of man’s rationality to be unaffected by the Fall, therefore, they do not have a Reformational epistemology. Helseth skillfully (and refreshingly) counters this charge. He shows that the Old Princeton theologians had an understanding called “right reason,” or, reason reliant upon moral and spiritual categories. Therefore, the use of the previously mentioned modern methods and philosophies does not preclude the charge of Enlightenment rationality; and, theoretically, there can be a place for those methods within a genuinely Reformational epistemology. There is a lot of really good information in this book. If you enjoy reading some older theology, history of theology, and how that history of theology has been written, then this book is highly recommended. I have gained a lot of benefit from the theologians that Helseth defends (Warfield on inerrancy and Machen on modernism are two of the brightest examples). It is nice to see a study defending their theology and methodology.